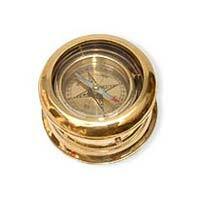 Our company is actively engaged in manufacturing, supplying, and exporting a wide array of Antique Compass to clients. It is precisely designed using premium raw material and sophisticated technology. Our Antique Compass has a robust construction, perfect finishing, appealing sundial, and long lasting life. It can be used for decorative or gifting purpose. Customers can avail Antique Compass from us at market leading prices.